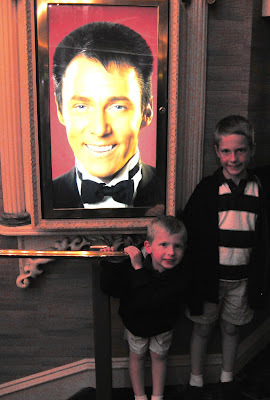 We took the boys to see Lance Burton, a family friendly classic magic show at the Monte Carlo. I personally was a bit freaked out by his billboards and posters which show a man who has either been airbrushed beyond recognition or is a disciple of Botox. But several people recommended it as one that the kids would love and since this trip was work related for Daddy's job on a magic show, it was an obvious choice. True to the recommendations, it was a great show with lots of doves, ducks, and even a goose, always a kid pleaser. At one point he asked for kids to come up and help him with a trick, and an usher pointed at Nathan and told him to go up, which he enthusiastically did, along with a dozen other children. Lance commented that he liked Nathan's striped polo shirt, and said that stripes really make a person look tall. Then he said "See? Look how tall he looks compared to... her" and pointed at a tiny toddler who had come up with her big brother. Nathan laughed (along with everyone else). He got to help with a trick where Lance had a bird cage in his hands (with a parakeet inside) and told all the kids to put their hands on the cage. Then he counted to three and the bird cage disappeared. Afterward Nathan told us that maybe magic was real. He is a natural born skeptic who is constantly trying to figure out how things work. But he said that one moment his hand was on the cage, and the next minute it was completely gone, and surely magic can be the only explanation! Nathan had a little taste of being on stage in front of 1,274 audience members and has now declared that he wants to be an actor. We'll see how many days that lasts!